On the heels of last week's announcement that a "Dirty Dancing" remake was in the works, buzz is generating about Jonah Hill's upcoming movie, "The Sitter," which many are calling a remake of another 1987 classic, "Adventures in Babysitting." I'll forgive Roger Ebert for calling "Adventures in Babysitting" "Ferris Bueller's Sister's Night Off," and for giving it a thumbs-down (but Siskel gave it a thumbs-up!). It remains a favorite to this day. In the film, high school senior Chris Parker (Elisabeth Shue) babysits Brad (Keith Coogan) and Sara Anderson (Maia Brewton), along with Brad's best friend, Darryl Coopersmith (Anthony Rapp). This all happens after Chris' dream date with Mike "SO COOL" Todwell (Bradley Whitford) is canceled. Chris' best friend (Penelope Ann Miller) needs a lift home from the bus station "downtown," and the gang is whisked from their idyllic Christmas card suburb to Chicago. Just as their car hits the city limits, they get stuck on the side of the expressway with a flat tire. When hook-handed mechanic "Handsome" John Pruitt offers to help them get a spare tire, the film takes us to: a shootout between Pruitt and his cheating wife's lover; a chop shop; a blues club; a gang fight; a frat party (featuring George Newbern before Paul Rudd stole his career); exterior skyscraper windows; an underground garage with a young, hard-bodied Vincent D'Onofrio as garage owner Dawson; and other deadly, totally plausible locales. Weaved in with the excitement and humor was an amazing soundtrack that, unfortunately for audiophiles, was never released as an album. 'Tis a pity, as what other '80s movie can boast of a soundtrack featuring the Rolling Stones, Muddy Waters, Sam Cooke, Iggy Pop, The Crystals, Edwin Starr, Jr. Walker, Percy Sledge and Chicago's own Southside Johnny? Of course, the song that stands out most is Albert Collins' "Babysitting Blues," which Chris & Co. serendipitously "wrote" on the spot while trying to escape the wrath of the chop shop operators. The "Nobody gets out of here without singin' the blues" scene is a must-see. Keith Coogan, who provided the voice of Young Tod (the Fox) in "The Fox and the Hound" and is currently promoting the movie's DVD release, spoke to Marquee. Marquee: What do you remember from the "Adventures in Babysitting" shoot? Keith Coogan: Oh, gosh, people always ask me, "Do you have any funny stories about that movie?" but the whole thing was such a kick. One of the first nights on the set was five of us in the cab of a truck with John Ford Noonan playing John Pruitt and bouncing around, cameras falling off, working into the night and all of us having a great time. We were literally dropped into the middle of the story when we started filming and it was immediately chaos and madness and fun. Marquee: Did you do anything to prepare for the role? KC: We were told by Chris Columbus, the director of the movie, to watch "After Hours" and I think it was "Horse Feathers" or "Duck Soup" with the Marx Brothers to get some of that screwball comedy timing down, which I think Elisabeth Shue just did a great job at. Marquee: Have you kept in touch with your co-stars? KC: I talk to Anthony (Rapp) from time-to-time, who has become just a huge success with his music and "Rent." Anthony had been on Broadway before "Adventures in Babysitting," his passion was there, so it was no surprise to see him do such a great job with that. Marquee: What was it like working with Elisabeth Shue? KC: Oh, she's a dream. I had the hugest teenage boy crush on her. The day we shot the scene in the lobby of the Associates Building where the guy's cleaning the floor and the bad guys are chasing us - I turned 17 that day. Elisabeth was 23-years-old, so there was a huge age difference, but I could dream, I could hope. Marquee: Did it lead to anything? KC: During the rehearsals I said to Elisabeth, "There’s a nice restaurant in the lobby of the hotel. We could go to dinner and talk about the movie." She says, "Sure" so we go and it's one of those movie moments - I'm in a T-shirt and they go, "We require a jacket and a tie." So they bring me a jacket to put on in this fancy restaurant and we're sitting there and I go, "You know what, I know there's an age difference but we're kind of romantically linked in the movie and perhaps we could become friends and then date... " And she laughed in my face. And that's exactly the laugh she does in the movie. She totally crushed my heart and I took that with me for the movie. When the frat boy rescued her in the movie I was very jealous and felt very possessive of her. Marquee: Did you rehearse a lot before shooting started? KC: We did a lot of improvised rehearsals. The director and the producers said as long as you have two or three great memorable sequences then you have a movie. So they focused on the blues bar scene, the train sequence with the gangs and the chop shop. All that stuff with Joe Gipp was amazing. His line, "A mall?! Where do y’all think we are, Boise, Idaho?" was improvised, totally him, and a lot of those lines came out of those kind of improvised rehearsals where we really peeled open the scenes and had a lot of fun playing with them. Marquee: Do you have a favorite scene? KC: I love the end. I love how my character doesn't get the girl, and has to kind of let that go and mature in his own way. That last scene felt a lot like "Sixteen Candles" or "The Breakfast Club." Marquee: Any chance of a 25th anniversary Blu-ray release? KC: From Katie’s lips to God's ears! With [actor] commentaries to add some value. Get [director] Chris Columbus in there. I'm sure we all have different perspectives. 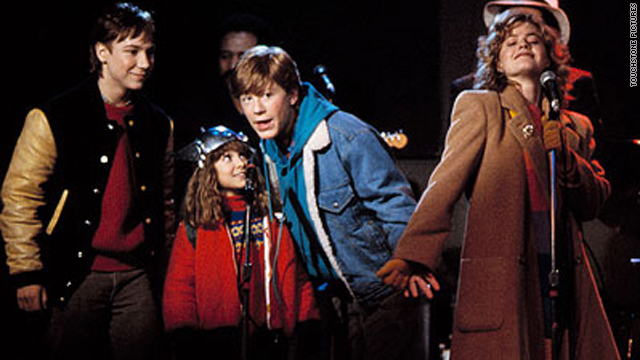 I would LOVE a commentary of "Adventures in Babysitting." Marquee: You played Young Tod in "The Fox & The Hound." What do you remember from that experience? KC: We were 7, 8 and 9 - it took a few years to make - and they brought me and Corey Feldman (who played Copper the Dog) back nine months later to do more dialogue and let our voices age a little more for scenes later in the movie. And I remember going to the voiceover stage at Disney, which is the stage they’ve always used to make stuff, and do additional dialogue replacement looping. If I recall correctly the guy who coached us through was the voice of Goofy and he would bust that out and entertain the hell out of us. So that was really nice, especially since you do it all by yourself. Here's one last tidbit from the interview with Coogan: Elisabeth Shue's friends and family call her Lisa. Who knew? And am I the only one who thinks "Adventures in Babysitting" needs a proper DVD release, complete with a cast reunion, commentaries and oodles of extras? I say we need to start a Facebook group. Hot dog vendor: "You slip me the cash and I'll slip you the wiener." Brenda: "But I don't have any cash!" Hot dog vendor: "Then I don't have a wiener!" Sarah's probably hanging from the rafters by now. I found it funny when Sara got even with Brad for calling Thor gay. That wa priceless. Brenda: Chris I'm begging you, it's really scary here. I've just seen three people shoot up, a bald Chinese lady with no pants on, and there's this old guy outside who wants his bedroom slippers! Old Man: [banging on telephone booth] Get out of my house! Brenda: [kicks out a small box and the guy's slippers] You just moved! My sisters and I still quote that to this day! Loved this movie and would love a DVD release with commentary! OMG. This batch of Hollywood writers has got to be the laziest I've ever seen. Its just disgusting. WRITE YOUR OWN BLOODY MATERIAL, INSTEAD OF REMAKING EVERYTHING OLD, you bloody lazy children. My FAVORITE line is when "Thor" smiles at the little girl and say, "I have one of these already." Melt. I still watch it on my scratchy old vhs tape I recorded off tv. I love this movie ! When I saw the previews for The Sitter, the first thing I thought was that it reminded me of Adventures in Babysitting. I am glad someone else thought that movie was great too. I loved it as kid! Oh man, I forgot all about that movie! Loved it! Hope they do a darn good job re-making it...it's 1 of the classics to me! Hello, I'm Hollywood and I've run out of origional ideas. My two favorite quotes have been stolen! But, please release this on DVD!!! It is on DVD. I own a copy of my own. This is the result of the first crush I ever had. Elizabeth Shue was my first celebrity crush. Southside Johnny, a CHICAGO native??? It doesn't say he's a native. At the time, he was Chicago-based. I loved those movies too! "Don't tell Mom" was another underrated movie with lots of great lines. "Don't F#@k with the babysitter"
the end of the movie when they guy says he needs a babysitter- she asks for who- he says "for me". Awwww. I liked when she told her cheating ex that "this kid has a lot more class than you". It would be great if Hollywood had an original idea floating around. It appears it doesn't. This must be so frustrating for established and up and coming writers with good ideas and scripts. i remember anthony rapp looking like the guy that plays ron weasley in harry potter movies. adventures in baby sitting was good times, loved it when i was a kid.. Loved this movie along with "Don't tell Mom the babysitter is dead" "Goonies" and "Red Dawn," watched them all the time from VHS and TV. You clowns thought I was gone, eh? I'm back... where is the punysher guy at? "don't f*&C with the lords of hell!" "don't f*&C with the babysitter!" or the ever great: ya think? an the entire babysitting blues segment....funny stuff even all these years later. The gang leader says:"Don't Fu*ck with the Lords of Hell! Chris: "Don't Fu*ck with the babysitter! LEAVE THE CLASSICS ALONE HOLLYWOOD. Stupid, stupid producers.